It rained overnight and was misty this morning. Fortunately we had winds to blow out the clouds. Unfortunately, those winds were from the south west, so we had headwinds all day. The terrain had gentle ups and down with occasional trees. 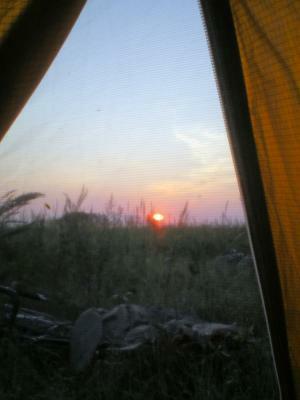 The mosquitoes knew to find me, so I quickly broke camp and was on the road. The village of Знаменка was celebrating 100 years this year. A few people were already out putting their produce along the road for sale. It was quiet riding through the woods that brought me to a cafe at 29km.a little before Дальнереченск. We passed along the city itself at 40km. We also came across a village of Аэропорт which curious enough didn’t seem to have anything to do with an airport. At 56km was Филино which looked mostly like a military base. At 67km there were suddenly gravel roads for a few kilometers as we went through a road construction area. I even walked past the worst pot holes. I was getting hungry but we didn’t find a store until Ружино at 89km. A little further at 96km was turnoff to Лесозаводск and a cafe. 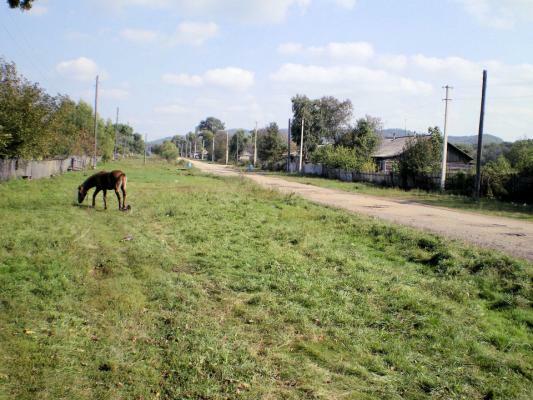 We walked into the village of Лесное to get water and then camped some kilometers later in an open field.